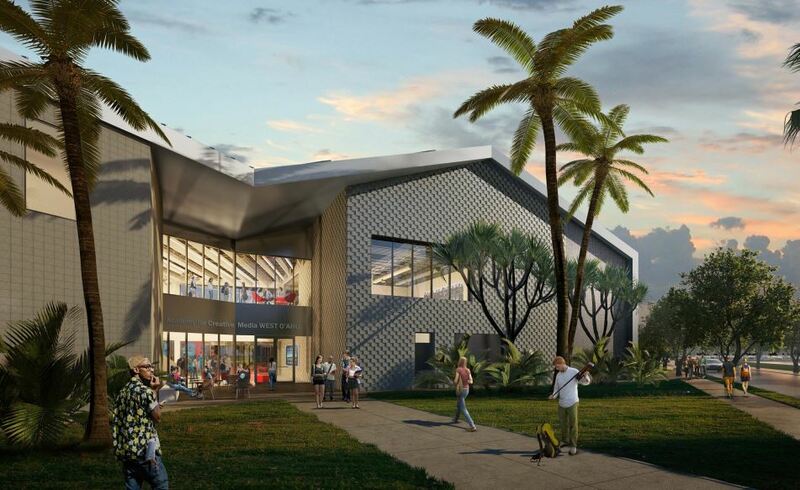 A design-build contract was awarded for the new University of Hawaiʻi Academy for Creative Media building – designed to engage, educate, and incubate. The building, located on the UH West Oʻahu campus, will link complementary facilities and programs throughout the UH System and across the state as a catalyst for Hawaiʻi’s intellectual property workforce. The base contract of $33,275,000 was awarded to local contractor Kiewit Building Group and local architect firm Next Design. Rendering of the new Academy for Creative Media building. 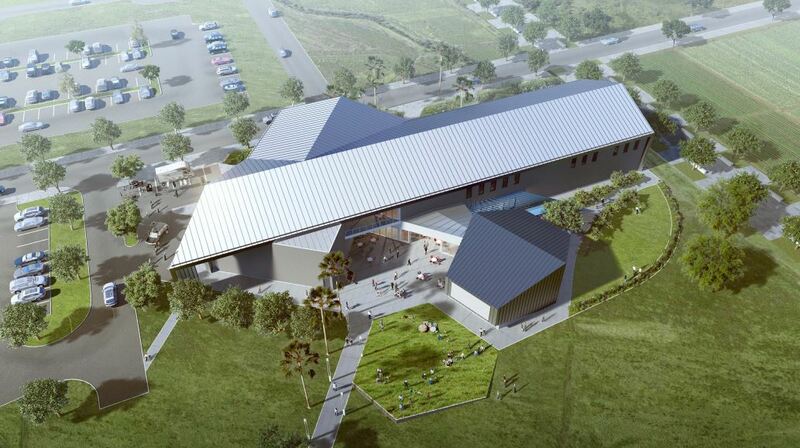 The new Creative Media facility at UH West O’ahu will be a 42,000 square foot facility consisting of production spaces that include a two-story sound stage for filming, 100 seat screening room, Foley stage for sound reproduction, editing suites, sound mixing suites, mill shop to create film sets, and equipment cages. Teaching spaces will include a 3,000 sq ft sound stage, maker space for set building and 3d printing, four editing suites, an adr and foley studio, a digital intermediate color mixing suite, flex classrooms, three computer labs, an emerging media lab for advanced interactive cyber visualization applications, as well as an incubator for student run companies. Various collaborative spaces are spread throughout the facility to accommodate small and large groups interaction and include an incubator space for students to gather in a professional environment to encourage entrepreneurial ideas. Support spaces include a café, lobby, faculty offices, workrooms, faculty lounge, meeting rooms, storage, and server room. 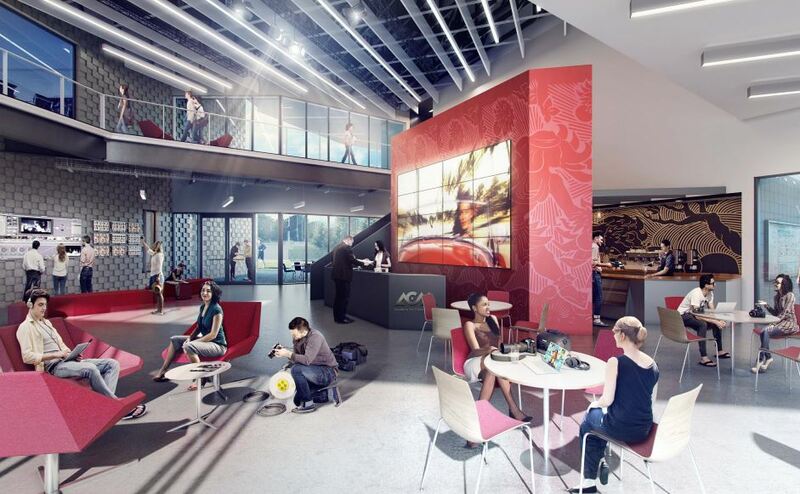 The building will feature a 100 seat screening room with dolby atmos mixing panel, 4K laser projectors, a 16’ wide x 9’ high LED video wall in the lobby to display student work, interactive teaching boards, remote learning/video conferencing equipment, video/sound editing equipment and digital signage. An outdoor screening area will allow hundreds of students to enjoy special evening screenings and presentations. The building is designed for 24 hour access and will include a “grab and go” coffee bar in the lobby. The project is in the design development phase, which is expected to be completed in December 2018. Construction activities are anticipated to start in January 2019. Substantial completion is expected in June 2020 with the new facility being ready for classes in Fall 2020.
supporting complementary creative media programs at all ten campuses. The programs teach the 21st century skills at the nexus of evolving technology, art, storytelling and content creation that students need, not just in the media fields, but across all industries. ACM System is part of the UH Systemʻs Office of the Vice President for Research and Innovation. For more information visit www.acmsystem.hawaii.edu. Tagged Academy for Creative Media, animation, applied science, Chris Lee, creative media, game media, Humanities, interaction design, Maenette Benham, moving image, photography, popular media production, smart phone apps, social media and transmedia production, video, virtual and augmented reality, web design and development, www. Bookmark the permalink.